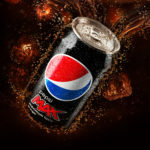 Image for calories in Pepsi Max: Pepsi. Source for calories in Pepsi Max: Pepsi. How many calories in Pepsi Max? There are 1 calorie in a 330ml can of Pepsi Max. There are 2 calories in a 500ml bottle of Pepsi Max. There are 0.4 calories in 100g of Pepsi Max. About 0% of the calories in Pepsi Max comes from fat. About 0% of the calories in Pepsi Max comes from carbs. About 0% of the calories in Pepsi Max comes from protein. How much fat in Pepsi Max? There are 0g of fat in a 330ml can of Pepsi Max. There are 0g of fat in a 500ml bottle of Pepsi Max. There are 0g of fat in 100g of Fanta Pepsi Max. How many carbs in Pepsi Max? There are 0g of carbs in a 330ml can of Pepsi Max. There are 0g of carbs in a 500ml bottle of Pepsi Max. There are 0g of carbs in 100g of Pepsi Max. How much protein in Pepsi Max? There are 0g of protein in a 330ml can of Pepsi Max. There are 0g of protein in a 500ml bottle of Pepsi Max. There are 0g of protein in 100g of Pepsi Max. diet coke, diet cola, zero cola, sugar-free cola. beverage, beverages, drink, drinks, soft drink, soft drinks, fizzy drink, fizzy drinks, soda, fizzy pop, fizzy pops.